I'm having so much fun each month with The Traveling Quilts bee - both creating blocks and watching the rest of the group work. (If you aren't familiar with the bee, see this and this.) For round two, I received Penny's blocks from Jacquie. 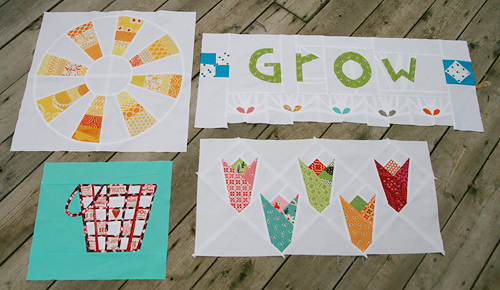 Penny started her quilt with the "Grow" section with the sprouts and the basket. I think we can all agree that she is an A-M-A-Z-I-N-G paper piecer. Jacquie added the perfect selection of scrappy tulips. 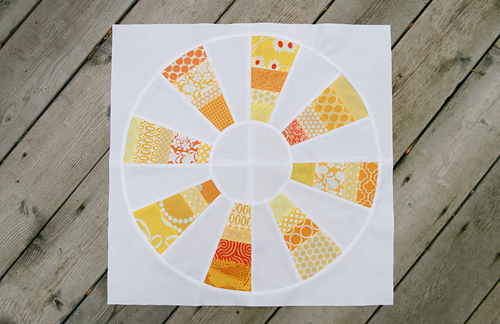 I decided that every garden needs a sun to grow - so I made a sunshine using this template from the Purl Bee. I was inspired to use this pattern by Jeni's color wheel. I think this was my first time making a circle. It wasn't so bad! Lots of pins though. My blocks looked like torture devices as I was sewing them. The quilt blocks are now off to Ashley, I can't wait to see what she adds!